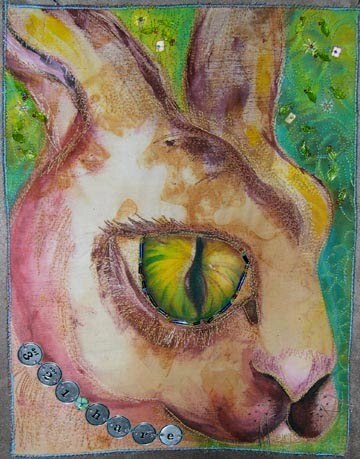 Here is my entry for Quilting Arts Magazine’s Inner Animal Challenge. Sadly my piece was not chosen to be sent to them. So I can post it here for you to see. Congratulations to all the great art quilters who had their piece chosen. The title of the piece is the “Eye’ds of March Hare”. I was born on the first day of spring when that was the 21st of March. Now due to the calendar or something it is the 20th of March. My inner hare wears a necklace with my birthdate on it. Some people would like to be a cute fluffy, furry bunny but I’ve never been accused of being fluffy. Although I must admit as I get older I get fluffier around the middle. My inner animal is a hare who is strong and capable and doesn’t put up with much nonsense. I simply don’t have time for it since with RA it takes me way more time to do things I used to fly through. I would love to be able to flit and hop around like the proverbial March hare but sadly that is one of my inner qualities that I can only dream about now. This was done with rust dyed fabric and painted with textile paint. Free motion stitching forms some of the fur and the background is quilted in clover. The large eye is trapunto and surrounded by beads for sparkle. The background is also beaded. I even gave my inner animal whiskers since she doesn’t have to hide them or cut them off like I do. I love your hare! She certainly looks strong and no-nonsense, but dreamy, too. It's a beautiful piece–so sorry it didn't get chosen. I love the hare and the story that goes with it. Thanks so much for sharing your 'inner self'. Wonderful hare and thank you for sharing. It is hard to imagine what the ones they accepted look like because yours is fantastic. Great hare and that eye is fabulous. Competition must be very, very stiff that this didn't get in. Must see the ones that made it when released.